Lucius Domitius Alexander, Vicar of Africa rebelled against Maxentius, and proclaimed Emperor by his troops, ruled between 308 and 310 A.D. His reign, poorly documented, has never been deeply studied, and his coins, extremely rare and widely forged suffered the same shortage. 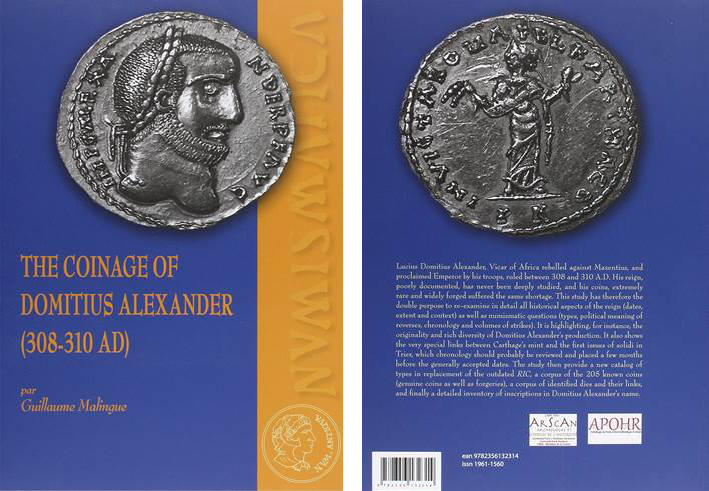 This study has therefore the double purpose to re-examine in detail all historical aspects of the reign (dates, extent and context) as well as numismatic questions (types, political meaning of reverses, chronology and volumes of strikes). It is highlighting, for instance, the originality and rich diversity of Domitius Alexander’s production. It also shows the very special links between Carthage’s mint and the first issues of solidi in Trier, which chronology should probably be reviewed and placed a few months before the generally accepted dates. The study then provide a new catalog of types in replacement of the outdated RIC, a corpus of the 205 known coins (genuine coins as well as forgeries), a corpus of identified dies and their links, and finally a detailed inventory of inscriptions in Domitius Alexander’s name.